family and had a fun day in Durango. As we ventured through the shops, we came upon this artist gallery that had everything from paintings to jewelry. I was just looking at everything and no intention of getting a new ring, but this one ring just struck me as being so beautiful and so simple. It was made from a rough cut diamond and simple silver band with a gold wrap. I pointed it out to Don and told him it was the most beautiful ring I have ever seen that I would like to have. So, yep, he had to special order my size. When the ring came in, I was just so excited. It speaks to me volumes by how the diamond is still in the rough and a little off color from what we think of as a diamond. But the ring is mine and I love looking at it and showing it to others. So, I wanted to give you the link to this talented jeweler in Durango. If you are thinking of getting married or doing a vow renewal, please check out Diane West, and see if you might fall in love with one of her rings also. 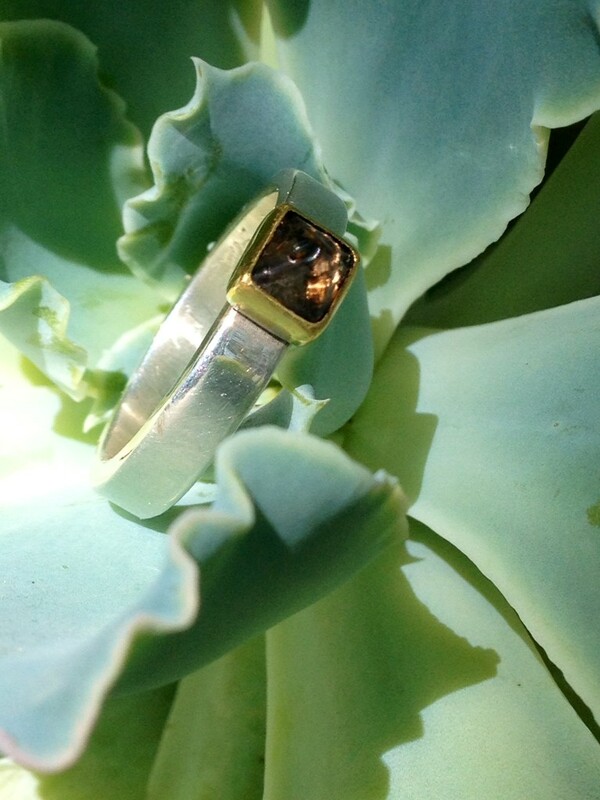 This entry was posted in Deb's Doodles and tagged custom rings, rough cut diamonds, wedding rings by admin. Bookmark the permalink.